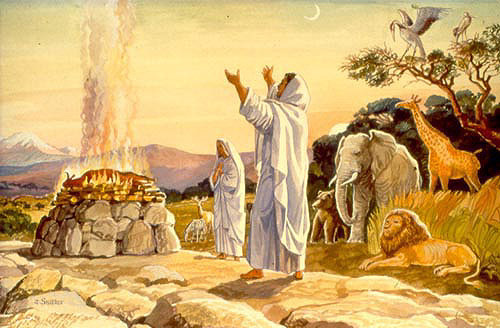 The connection of the Haftorah to the Parsha: In this week’s Parsha, we read of how one man, Noah, followed Hashem's directions and in turn was responsible for saving the world. In this week’s Haftorah, the prophet Yishayahu reminds us of Hashem's promise to never flood the world again, as he did in Noach's time. In the spirit of mercy, Yishayahu comforts the people of Israel that are in exile with the words "For the mountains may be moved and the hills may falter, but my covenant of peace shall not falter, says the One Who shows mercy, Hashem". The storyline of this week’s Haftorah: Jerusalem will be rebuilt with precious gems and all the Jews will know the Torah. ”Rani Akara Lo Yalada.” Yishayahu instructs Jerusalem to make more room for the incoming exiles and sing for the redemption of her children. The Jews will increase vastly and Hashem will gather the Jewish Nation together, never to disperse them again. Hashem will comfort Bnei Yisroel by saying that the present situation is temporary. Hashem reminds them of the promise He made to Noah, and is promising that He will never become angry with Bnai Yisroel again. Hashem’s kindness will not leave them and His peace will endure. Hashem will rebuild Jerusalem with gems. If the Jews obey Hashem, they need not fear their enemies, because Hashem will make them powerless. Hashem will be righteous to the Jews. Yishayahu extols the virtues of Torah study and reiterates the benefits to those who study it. Torah can bring Mashiach (Messiah) and redemption. Was killed by Menashe, the King of Judah. Yishayahu was hiding from Menashe, the King of Judah, in a tree, but as Menashe was passing by the tree, he spotted Yishayahu’s tzitzit hanging out of the tree. Menashe then cut clean through the tree, killing Yishayahu. Yishayahu was killed through his mouth as a midah kineged midah, measure for measure, for speaking lashon ha’ra about the nation of Israel. Famous Phrases: Isaiah 42:21,” Hashem chafetz le’ma’an tzidko yagdil torah v’ya’adir”. “Hashem desired, for the sake of Israel’s righteousness, that the Torah be made great and glorious”. This is the last pasuk of the prayer "Uvah Letzion” said three times a day, just before we say “Aleynu Leshabeach”. Haftorahman’s lesson of the week: The well known aphorism “one person can make a difference.” There is a story of a Torah teacher of modest means that would spend his summers teaching in a wealthy community. The constant company of wealthy people engendered feelings of unworthiness in him at times. At summer’s end, a student approached him and said, “You can never tell the impact you have on other people, by just looking at them.” She explained that she had lost her husband and had to raise two young children herself. As the days passed following her husband’s death, she drifted away from G-d. Until one day, she stayed with a friend for Shabbat and she was invited to attend the Torah teacher’s shiur (class). The shiur inspired her to reconnect with G-d; she proceeded to return to the shiur the next week with her children, hoping that they would be similarly positively affected. Week after week, they attended this teacher’s shiur, until the course was over. “You see, I can thank you for pulling me back into the ways of Hashem; however I can never thank you enough for having pulled my children back in as well.” The teacher then thought to himself, “I guess being a speck of dust is not so bad.” Noah was one man and in his merit, mankind was saved. One person can have a massive impact. If you help one person, they might be inspired to help another two people; there is a ripple effect. As Jews, we are leaders and it is important to lead ourselves, family, and friends closer to Hashem. This actualizes our reason for being, so pick a mitzvah to fulfill and expand on a good midah (character trait), so that we can truly celebrate life. 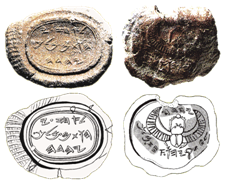 The Seals of the King Ahaz & his son Chizkiyahu who reigned in Isaiah’s time. Timeline: This Haftorah takes place just before the Bait Hamikdash (Holy Temple) was destroyed about 2600 years ago.